I was an Apprentice Cabinet Maker at Jaycee Furniture from 1955 to 1960. I started at the Hove workshop, Old Shoreham Road (next to the Goldstone Ground) in 1955 and then moved to Regent Hill, Brighton the same year. Tea and lunch breaks were often taken outside in the sun, behind Marks & Spencers, as can be seen in photo. George Williams, seated left, was my Cousin’s (Roche Family) Uncle. George was a thorough Gentleman liked by all. The others are Cabinet Makers, Labourers and apprentices. Some names escape me but from what I can remember, left to right: George Williams, Jimmy ?, Geoff Lewis, ? ?, Colin ?, should know! he was at my Bucks night, and I should know the Apprentice standing? He lived at Worthing and I used to give him a lift to work on my motor bike, in the ice and snow, scared the stuffing out of him! I worked at Jaycee Furniture from 1963 until 1982. Although I started at the new factory at Woodingdean I do recognise some of the faces in the 1958 photo. Second from left is Jimmy Edwards, then Geoff Louis, fourth from left I think is David Knott and next to him is Colin Richardson. I am still in contact with David Knott and will ask him if he knows the names of the others. No Roger, that’s not Dave Knott Dave was a mate of mine and he attended my Wedding in 1959. You are right about the others. The Guy 4th from left was a young labourer who was learning to use the belt sander. When you speak to Dave, give him my regards and remind him of the time we were on the top deck of a bus after a night out when the ex Albion Winger Frankie Howard, wanted to take us apart for what he misconstrued as insulting behavior to a young lady. We were infact minding our own business and laughing about a recent Goon Show episode while mimicking some of the Characters. We hadn’t even noticed the lass. But Frankie was adamant that we were in the wrong. There were only 4 of us on the bus. Frankie was in no mood to listen to our explanation of Goon Show humour, so we sat out the rest of the journey in silence. I can confirm the names that Roger Albrow listed above and have also spoken to Ray Stevenson who thinks that he may have taken the photo. I remember Keith Upward who I thought went to Australia ? Any more photos Keith? Oh Wow Roger. Thanks so much for posting this photo. Jimmy Edwards is my dad who is now living in Derby. I shall print this photo off (with your permission ) and send it to him. He will be amazed. Sorry – thank you to Keith for the photo. Lorraine, you’re welcome to use the photo. I knew your Dad quite well, he lived in Westbourne Street, Hove, I believe. I think I’m right in saying, that your Mum was only 14 when her and Jimmy were engaged! He had to do his National Service before they married! It probably was Ray Stevenson who took the photo with my 127 Kodak bellows camera. I caught up with Ray when he came out to Australia on a promotional visit for Jaycee in about 1980. I was working as a Building Inspector in Melbourne and while walking to work one morning, I spied Ray demonstrating wood carving in the front window of a department store! I walked up to him and just stood there until he recognised me. I hadn’t seen him in 20 years. I invited him to have dinner with my family that night. He knew my wife Mary, who he had actually dated before I did, back in the mid 1950s. I don’t know if Ray remembers, but we were in a school play together at Hove Manor School (Connaught Road). Ray played the part of my Mother! I had one line which I muffed but Ray was very good! We were in the class that designed the new school badge, under the guidance of Jack Mutton our art teacher. Yes Dave! I’m still in Australia, nearly 50 years now! I’m now living on the Sunshine Coast in Queensland, I’m retired from building but pretty active as a football coach, coaching kids at local schools and a women’s team at club and rep level. Still married to Mary! 49 years in December. My e-mail address is: mup30636@bigpond.net.au if any of you want to contact me. Thanks so much. I spoke to Dad on the phone last night and read out the names mentioned here and he couldn’t believe it! As soon as I get the printer working, I shall print it off and send him the photo. I sure it will take pride of place in his workshop – yes, he stills makes beautiful furniture from time to time. You are correct, Dad did live in Westbourne street. They say its a small world. Darren (Jim’s youngest ) moved out to Oz three years ago and joined the Australian Army. They are in Toowoomba. Lovely to hear from you and thank you for bringing back all these wonderful memories. I worked at Jaycee from 1957 to 1982. I started in sub-assembly with Mick (Shaggy) Lane, Mike Cheesman, Terry Dowden, George (Knock it up Wrong) Carter, Jack Fraser. My take on the photo starting from the left: Ron (Rip) Kirby, Jimmy Edwards, Bill Howells or Geoff Louis, Mick Chivers, Colin Richardson. I don’t know who it is standing – a guess, Ken Townsend? I’m with Roger Albrow and David Knott this Saturday 11th at my daughter’s wedding. Hi Guys, Dad ( Jim Edwards ) has been thrilled to know that you have all been making contact through this site. He is full of memories of you all and the great times he had at Jaycee. He has been telling me about the dreadful winter when the weather had all but snowed everyone in. He apparantly walked some of the way from Portslade and at one stage, hitched a lift with a milk float! (That’s what you call dedication to work). Hope your daughter’s wedding goes well at the weekend Bob. Could you pass on Dad’s regards to the other guys please? Thank you. Hi Bob, Unfortunately you are wrong on most counts! From the left: 1. George Williams, 2. Jimmy Edwards, 3.Geoff Lewes, 4. A young labourer who took over in the sanding shop, 5. Colin Richardson, 6. can’t remember his name but his two older brothers worked at Jaycee, one a leading hand, he came to my Bucks’ Night! 7. standing, apprentice who was fast tracked to the office. I used to give him a lift to work on the back of my motor bike from Worthing. Most of the others you mention, I knew very well. I went to Mick Lane’s wedding. He and Mike Cheeseman worked at the Hove factory where I started in 1955. Terry Dowden was a mate who I used to go chasing girls with at the Court School of Dancing. George Carter (Orson) was Mr Nice Guy, no longer with us. Jack Fraser was an ex coffin maker in the Indian Army and a story teller of note. (We worked in the assembly shop with Mick Lane, Mike Cheeseman & Tony ?? under leading hand Tom Evans, until I was moved up near the Carving Shop. Mick Chivers worked in the same shop as Colin Richardson. Ken Townsend was a mate of mine, I think he was doing his National Service when the photo was taken (which I took with my 127 Kodak bellows camera!). Dave Knott (Knotty) was also a mate that I used to socialize with, he attended my wedding on 19/12/1959. But I’m sorry to say Bob, I can’t remember you! Maybe you can jog my old memory. Hope your daughter’s wedding went off OK. I joined Jaycee in 1966 as an apprentice. By this time they had re-located to Bexhill Road, Woodingdean but many of the names listed above I worked under in my early years. The names I remember are:- Dave Knott, Geoff Louis, Bob Andrews, Colin “biker” Richardson, Roger Albrow, Jimmy Edwards etc. I learnt a lot from you all which enabled me to open my own factory in Sunderland. I had to take early retirement to care for my wife Colette who has been very ill and is now disabled. Many thanks to you all as you helped to shape my career, kind regards. I learnt today that Ted Leaver has died at the age of 71. Ted, I believe, worked at Jaycee in the sales office all his working life. He started in 1953, left to do his National Service and then returned. He was another great character that I have great memories of. Hi everybody, I attended the Manor from 1954-58. We were under the control of Mr Rothwell and cane then. He followed Mr Ralph. I wonder if anybody has a picture of the school badge? It used to be on all excersize books etc. Managed to track Ron (Rip) Kirby down and you are right – he is not in photo. He started on the same day as Ray Brinkhurst at Scarborough Road by Preston Park, he never worked at Regent Hill! Is Jimmy still playing football – ha ha, or can he remember the Jaycee team, Hollingbury Park our home ground? My Dad Ted Applin worked for Jaycee’s for most of his life, right up until 1998. Does anyone remember him? I would love to see any photos of him at work or if anyone has any memories of him. My brother Terry also worked there for a while. Does anyone remember the bread pudding? I worked at Jaycee until they closed. I well remember Bob Andrews, Dave Knott, Roger Albrow, Ted Lever, Jack Fraser, Ron Kirby and many more, with very fond memories. I would love to hear from anybody who remembers me. Hi Paul Yes we had some good times in the upholstery at Jaycee. 7.09 for a loose seat, 90 minutes for 411 or 447 I think! We also worked together at William L Maclean, furniture makers for 4 and 5 star hotel’s. All the best to you Paul and maybe we will meet up sometime. Hi Bob – would love to meet up sometime – a lot has happened in the past few years. Hope to hear from you soon. Can anyone tell me whether Jaycee is still trading? I ordered a piece of furniture in May 2009 from a local furniture retailer but they can’t get any response on the phone from Jaycee. I’d be very grateful for any info. While living in England (U.S.A.F. RAF Mildenhall) in the late 60s and early 70s, my parents purchased a beautiful wall unit model # T930. I must say it, nearly being 40 years old now, has held up quite nicely and looks very regal. I guess they either can’t or just won’t make furniture of this quality these days. It is in my home in Orlando, Florida now, so just thought you lot would like to know. Isn’t life very strange as I came across this tonight and tomorrow it will be 7 years ago that my lovely dad Colin Richardson passed away. It’s so nice to see that you remember him, funny to see him in that photo from all those years ago. I will show my mum this tomorrow. Ray kindly made me a beautiful carved sign for my day nursery when I opened it many years ago – still have the sign but no longer the nursery. I am currently trying to get in touch with Dave Knott’s daughter Angie as I was very good friends with her – but can’t seem to find any contact for her. I worked at Jaycee Furniture in the late 60s early 70s, in the “computer department” using card decks and programming. Worked in an office with I think Slyvie the bookeeper or payroll person and a lady in the computer room, can’t remember her name! Anyone who knows any of these people let me know. I am in Canada now have been here since 1974! I joined Jaycee as an apprentice in 1975. Along with Graham Geal, Kevin Gander, Geof Green and a few others. I remember the training school area, the phone would ring asking for one of us to go and work on one of the flow lines, and carting those ammo boxes, excuse for tool box, around – until we made one out of a drawer and fixed a hindged lid. Those were the days. The Regency dept, great bunch of guys, George, Mick, Ray, Glen and more – sorry, can’t remember names. Lunchtimes, summer or winter, I would check what the wind was doing. If anyone remembers me, you know I was a surf nut – well I still am, and make surfboards for a living now – have done for the last 21years here in Bude, Cornwall. Be great to here from you all. Was interested to see your comments about the factory in Woodingdean and thought some of the people who responded might be interested in an event called ‘Then & Now’ taking place in The Church Of The Holy Cross that aims to involve people in finding out about the history of Woodingdean. If you would like to come along and participate or just take a look please contact me via email. To Nicki Newman. Hi my name’s Kevin and Angie is my cousin. Can I help in any way? I have stumbled across this site while searching for early Jaycee furniture. My grandfather Jack Cohen founded Jaycee after the war and sadly, as far as the family tell it, my uncle Clive Cohen ran the company into receivership after Jack died suddenly in his mid 50s. If anyone has any memories to share or history they can impart of Jaycee under Jack it would be greatly appreciated. Hello Tom. My father, Harry Washington, used to work at Jaycee with Jack Cohen, your grandfather. I think Dad used to do office work, ordering supplies etc. I remember going there a couple of times when I was about 3 years old and seeing all the sawdust on the floor, and sitting in his chair. I believe the workshop was in Hove, this must have been 1949/1950? I cannot give you any more info as Dad passed away 6 years ago. I lived in 104 Langley Crescent. I used to take my 4 girls down the hill to school in all that ice and snow in 1958-9. Littlest on a sledge. Did anyone remember my friend Pam Lindsley who worked at Jaycee? Sadly she is now gone. We met aged 11 at Varndean and were friends until her death. I now live in Crawley. Did anyone know Dave Jarvis, cabinet maker, who worked at Jaycee’s? I came across this site by chance. My wife believes her mother, Ethel Jay, worked in the upholstery department in the early 1960s. We bought a Jaycee three-piece suite in 1965 which is now on its third re-covering. When I was about 4yrs old, we lived next door to Jack Cohen in Hove. I was in love with his daughter (Christine?) who was a few years older than me. I remember Jack had one of those Victorian wind-up electric shock machines. Does anyone remember my grandad Graham Rowland (Rowley) from the Woodindean factory? He is well and living in Lewes. I remember Rowley, quite a character – say Hi to him. I started at Jaycee in 1988 sweeping the floor and now have my own cabinet making business over here in Oregon. Jaycee was a great place to work and I bet it is sadly missed. They where brought out by Stag Furniture of Nottingham who ran into problems and took the Jaycee product to save themselves but alas I understand they couldn’t keep up the quality. Stag have gone too! I was apprenticed at Jaycee in 1965. There were seven of us in Geoff Louis’ training school. Stuart Purser and ? Bates were apprenticed at the same time. Although I had a jolly good apprenticeship with experience in most departments, once I had tasted the Contracts department where Jaycee furniture was made by hand to order (using some common components), I did not want to return to the flow line when the Contracts department later closed down. I remember Roger Albrow who was No. 2 to Trevor Rowbotham, Rod Piert from Manchester and difficult to forget was ? Rollins who leaned around corners when walking briskly around the factory. Presumably he thought he might spin off the gangways. Geoff Louis told me a story one day about his apprentice days at Jaycee, Regent Hill I believe. There was some building work in progress and seeing sand around he decided with the other apprentices to make a volcano. They piled sand up in the middle of the floor, made a hole in the middle and filled it up with French polish. After setting light to it, it burned pleasingly. Unfortunately polish expands when hot and at first the polish trickled over the top of the sand and ran down the outside alight maturing the volcanic effect, but it started expanding too much until it was running over the floor causing them to panic, hurrying them to extinguish it. The room was filled with smoke just as Jack Cohen walked in. Geoff told me they told Jack it was the smoke from being overworked but he took a dim view of it (through the smoke haze no doubt). I’d be very interested to learn about the Regent Hill site. I work in Crown House, the ugly office block on the corner with Upper North Street, and I imagine over your old factory. Just how big was your site and were houses also demolished to build Crown House? Peter, that Volcanic trick would have been in Farm Rd where Jaycee started. Geoff was still doing his National Service when they moved Regent Hill. 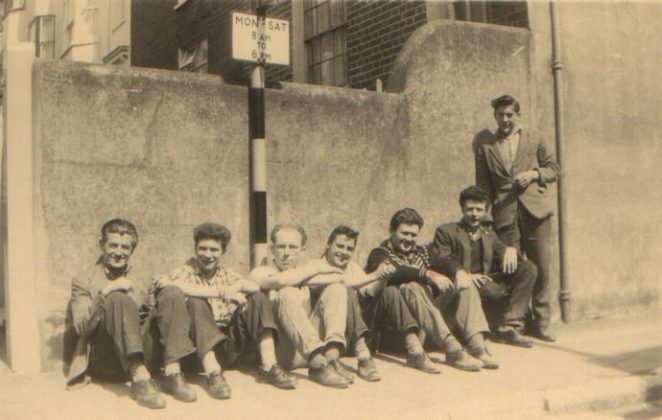 I started my apprenticeship in 1955 at the Old Shoreham Rd, Hove factory. We moved to Regent Hill in about 1956 and I was there for the start of the Flow line. I was hanging doors, pumping in 4000 half inch four screws every day. I didn’t like that either. Anyone remember my lovely old dad (r.i.p)? His name was George Carter and he worked at the Woodingdean site as a machinist until he took early retirement to look after my mother in the 90s. To Keith Upward. Why ‘Orson’ ? Did you live in Woodingdean? We lived on Bexhill Road. Nice to know he had friends- he never seemed to have many mates as it were and didn’t hit the pub much. Does anyone remember my dad Fred Covey, the saw doctor? He worked at both the Regent Hill and the Woodingdean factory for many years. Unfortunately he suffered a fatal heart attack while at work in the Woodingdean factory and died there, this was in June 1992, 20 years ago this year, where have all the years gone? My brother Richard Covey also worked there as did one of our neighbours from Batemans Road, Jack Larsson. I worked at Jaycee as a diesel mechanic working with Les Taylor for about 10 years at Woodingdean until the workshop moved to Eastbourne. I now live in Perth in Australia and have for 30 years. I met Peter Leonard here when I first arrived but sadly he died about 20 years ago. I used to play football in the Jaycee team when we won our division cup, nice to see that Bob Andrews is still about. I wonder if any more of the old team is still about? Wonder if they still play football at Hollingbury on the sloping pitches (that is where I broke my leg!). Glad to hear from anybody who remembers me. Seeing many of you here worked for Jaycee Furniture Ltd, Brighton Sussex, can any of you enlighten me to this rather strange low table we acquired recently? We are bamboozled by it and thought some of you who had worked in this company could help! It is horse-shoe shaped and low. It has extenders each horseshoe end. If any of you can give me any idea as to how we can identify, I would love to hear from you. Oh, its oak and has the Jaycee Furniture Ltd plus logo with ‘craftsmanship in wood’ and an engraving of hands. Thanks. I am Ted Lever’s daughter. He worked at Jaycee all his working life travelling from his home town of Burgess Hill to Woodingdean by train and bus. He loved his job and all the friends he made there. I have very happy memories of my dad, visiting him and going round the factory. Unfortunately dad was taken from us far too early but he always talked at length of his time at Jaycee. Does anyone remember me? I worked for Jaycee Woodingdean about 1996 to 1998’ish in the Antique department. ‘Scouse’ they called me, best footballer. Anyone remember sanding and age-ing the clocks, tables, etc? Good times. All best to all. Hi everyone… fascinated by all your comments. I have inherited some Jaycee furniture from my parents and have recently purchased a TV Unit to match. I was trying to find out some history on Jaycee furniture and also to try and work out why there are also so many similar items made by Wood Bros – Old Charm – can anyone throw any light on this and whether there was an original connection with Jaycee cabinet makers…. who came first Jaycee or Wood Bros, Old Charm.? The item I recently purchased was listed as Old Charm, but I knew it was Jaycee. Why are Old Charm using a lot of the same techniques and styles and fixings? And where do Old Charm stand in the market place compared with Jaycee? Any info would be gratefully received. Thank you kindly. Rachel. It would be great to have a reunion of many of those who worked at Jaycee. Please comment if interested and I will organise. Look forward to hearing from you. My dad, Ted Applin, retired in 1998 and sadly died of cancer of the oesophogus a few months after retiring. I always wondered if it was a result of breathing in all that sawdust and chemicals over the years? He worked for Jaycee’s as a furniture inspector from a teenager up until he retired. Does anyone remember him, I know I’ve asked before? He was related to Danny Guile who also worked there. Does anyone know a John Cohen? I was at school with him from 1960 to 1965. I think his father / family ran the factory. He would have been born in the early 50s. Does anyone remember my dad Bill Humphrey? He worked at Jaycee’s as a Furniture Inspector and was friends with George Carter. I also remember meeting some of his other colleagues: Dennis Rowlins and Richard Smith. Hi Nicki, are you on Facebook where I can forward you her contact details? Hi Kevin -I am on facebook under Nicki Midgley Newman. That would be great thanks. Thank you Nicki. I am also sorry to hear about your father. I wonder how many others there were that died this way? Sorry to hear about Dave Knott. He was a great friend of mine during our Jaycee days in the 1950s. He attended our wedding in 1959. I saw the comment you had to delete the request to give me info on Clive Cohen, but I did work at Jaycees in the late 60’s and early 70’s, is that still considered “third party”? Editor’s note: Sorry Glynnis, the point is that we do not allow requests for information on individuals who may not want their personal information shared. I was a driver with Jaycee from 1969 till Dec.1993 when we (the drivers) were all made redundant. Happy days. Hi there. I came across you whilst researching a project on ‘old’ buses used as Staff Transport. Have a couple in JayCee name. Can anyone please advise when JayCee finished up etc, how many buses roughly did they use, and where did they ferry their workforce to/from, please? Any information gratefully received and the same for any images of staff buses. Thanks and best wishes from Scotland. While I was working at Jaycee I only remember one bus. It was used to bring workers from Brighton & Hove to the Woodingdean factory. When more factories were opened in Eastbourne it’s run was extended to there. Hi. I have not seen any comments about the Eastbourne factory. I worked for H.A.the mid 1970s. We did a lot of dust extraction for all Jaycee factories.The last one being Eastbourne where me and Sid Bennett with others made and installed the extraction system. Shortly after I took my family to Australia. That sounds a bit rough getting made redundant in Dec 1993 just before Xmas. I used to work with a G.Tipping on Southdown buses in the 1960s and also Green’s sponge mixtures. I live in the San Francisco Bay Area. Most of my furniture was made in the Jaycee Brighton factory. I purchased it in the 1960s and early 70s. Does anyone know Ray Stevenson (head carver at one time)? I’m still in touch with him (Christmas cards). Even though he’s retired, he’s still carving some magnificent pieces on his own. I’ve never grown tired of my lovely English Oak furniture made by the Jaycee craftsmen. I used to get the bus from Hove to the factory at Woodingdean, it was a minibus with benches down both sides that we all sat on. Bill Hood who worked in the polishing shop used to be the doorman at the back to let us on and off at our stop. I can’t remember the drivers name, but if the oldies were late, he would wait a bit for them, but us youngsters he didn’t stop if we weren’t there. Fond memories. I have bought a piece of furniture made by Jaycee an old piece and it has 66 stamped on it at the back it’s a dressing table and would love to know a bit more about it. I will try and upload a picture and then if someone out there knows a bit more information that would be great! Was the Jaycee logo an owl? Hi I’ve just aquired a beautiful oak cabinet made by you Jaycee workers, but no key – lost in charity shop. It’s a lever lock, has anyone a photo of one of the keys, so I know what I’m looking for? I also have a small sideboard, which is a dream, it’s been polished with love for many years. The patina on it is absolutely fabulous. I love this sideboard a lot. Hi Gil Tipping. Remembering your name, Do you remember working up at Woodingdean as a driver with our dad Terry Burtenshsw? Hello, I remember taking that photo, and still have a copy! Only recently ‘retired,’ but I still do a bit of carving from time to time. Best wishes to all the old Jaycee workers out there! The Jaycee logo was two crossed chisels… I’ve still got them. I think the owl was used for one of the brochures but was never the proper logo. To all of Dad’s amazing old buddies from Jaycee, I am devastated to inform you that Jim Edwards passed away after a short illness last Saturday (6/5/2017). He spoke so fondly of his time at Jaycee and the friendships he made. Sad news about Jim Edwards, he genuinely was Gentleman and an all-round great guy. Through his lovely Daughter Lorraine, we had recently reconnected and I spoke to him on the phone recently when he visited his Son Daz, in Toowoomba, Australia. I’d known of Jim along time before I actually met him at Jaycee. We both grew up in the same community of Hove known as Poets Corner. He was a couple of years older than me and went to a different school. So our paths never crossed then. We got on well at work and I remember mostly, the mature adult conversations about life, that we used to have. My sincere condolences go out to his family and many Friends, especially to Lorraine, who has become a firm and dear friend on Facebook over recent years. To my old mate Ray Stevenson! I’m sorry Ray, but it was me who took that photo with a little 127 Brownie bellows camera. I have probably still got the negative. But if you have got a similar photo, then I would love to see it. You can find me on Facebook. Just found this page. My dad, Les Taylor, worked for Jaycee for many years as a mechanic with Micky Holt, I remember his name. Dad was at Regent Hill, King Street, then Woodingdean. He serviced some of the cars of the people there at weekends. Sadly he passed away 6 months ago, aged 87, he would have enjoyed reading these memories from other people who worked there. Hello all. I just stumbled onto this page. My family were the Australian selling agents for Jaycee from about 1959 till they finally closed. We enjoyed a long and pleasant relationship with many of the Jaycee names I read here and many others. My parents had a strong friendship with Jack & Doris Cohen. I remember staying overnight at the Cohen house early in 1966. I still to this day have a wonderful friendship with Ian Smith (export sales manager around 1973). Keith Endersby was there along with Ted Lever. Keith is still well and long retired. I well recall the time Ray Stevenson came to Australian and was doing carving demonstrations in some shop windows. Ray, if you read this, my parents are still alive and well. I think you used to exchange Christmas cards at one time. And Susan Brown. I think I would be able to find you an original Jaycee key if you still need one. Still got a few bits and pieces around. I started work at Jaycee Furn in Jan 1963 at the small shop in Brighton, later that year we moved to Woodingdean. I apprenticed there until 1968 when I emigrated to Canada. My first foreman was Colin Richardson and the on the flow line with Derek Vener. Names that come to mind are Beryl Cager, Alan Orr, Dave Knott, Dave Evans to name a few. Hello Ray, been a long time, how are you? It’s Paul. found this site trying to find old photos of Jaycee. Hi Keith, is this the same Jaycee furniture company that operated from Nottingham? Not sure if they are still doing so today. Does anyone remember the name of the jig maker next to the maintenance shop? I meant to ask Stuart Buckman before he retired. Stuart was head of the maintenance department, a tall dark haired quietly spoken chap circa 1965 – 1972+ and left to build a wood machine business in Albourne, and was able to keep in touch as a customer. I’m very sad to tell you that Mike Cheesman my father, sadly passed away on the 15th May 2018. we both enjoyed talking about his days at Jaycee and his many great memories. We also enjoyed reading this page and discussing the names he remembered. I know I have a wonderful photo somewhere of him sitting on his workbench which I will post when I find it. Thank you for starting this great page about Jaycee, he really enjoyed it. Wonderful to read all the old names that come up If I remember correctly the jig maker was Bill Parkes, an extremely clever but sometimes grumpy individual. I look back on my time there with great affection. It was a superb company to work for, particularly in the days when Jack Cohen was alive. I am now retired but when working had a Korean lady as one of my customers. She would buy up any Jaycee oak that she could find at auctions where it sold for practically nothing. She would then ship it out to South Korea where they could not get enough of it. So the old company lives on in perhaps an unexpected way. Hello Peter only semi-retired but getting closer to retirement.When I started SB Woodworking Machinery in 1986 there were ex Jaycee people everywhere in the local woodworking industry but now I cannot think of any still around. I remember a lot of the names mentioned above Micky Holt was a great friend I bought my first house from him and I bought his old Wolseley 1500 car. He, in turn, bought a trailer off me and parked it by the boiler house where a spark from the boiler set light to the cover. The dates are slightly out, I started in 1967, left in the 1970s and came back again until 1986. I saw my dad Tom Evans mentioned on here. Visiting a local furniture store, I wondered if Jaycee still existed. My dad went to school with Jack Cohen somewhere near the Hove site. I only know that dad became a supervisor at some point. Does anyone else remember him?